- Meets Second Wednesday of Each Month at 12:00. Meets Second Wednesday of Each Month at 2:00 at Randle Moore Center. 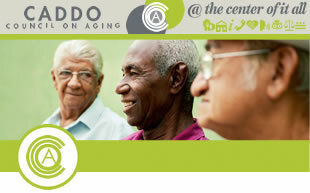 Meets Third Wednesday of Each Month at 2:00 PM at Bossier Council on Aging. Meets Third Monday of Each Month at 1 PM at Hattie Perry Community Center. Meets at 9:30 Last Wednesday of Each Month at St. Judes Catholic Church . Meets Third Monday of Each Month at 2 PM at North Highlands Methodist Church. Meets Second Thursday of Each Month at 12 Noon at David Raines Center. 1002 Bert Kouns Industrial Lp. Meets First Monday of Each Month at 2pm at Southern Hills Community Center. This is a refresher course designed to meet the specific needs of elderly drivers. The classes are usually two 4 hour sessions conducted on two separate days. Occasionally there will be an all-day Saturday class. Upon completion drivers will receive a certificate.